Georgia prepares to choose “the man on the white horse”. Or is it just his horse? The race is on for the office of President of Georgia after the governing Georgian Dream coalition led by Bidhzina Ivanishvili announced that it will nominate Deputy Prime Minister and Minister of Education, Giorgi Margvelashvili to the post. 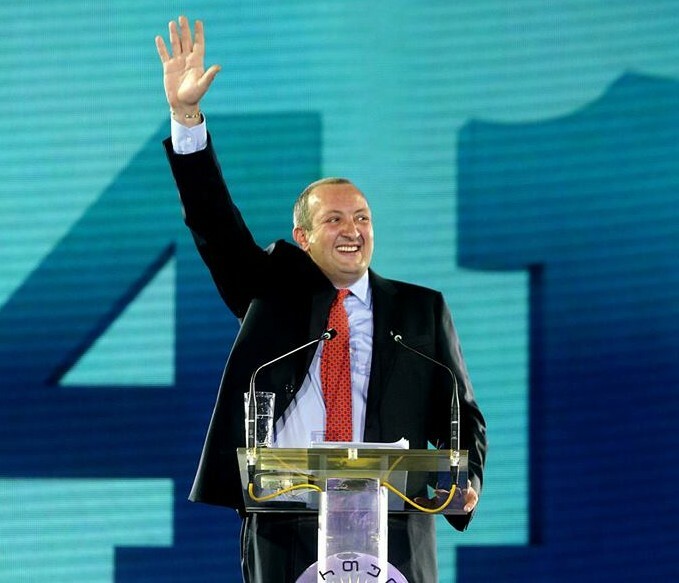 Given the massive victory that Georgian Dream registered in last October’s parliamentary elections and its continued popularity in recent opinion polls, Margvelashvili starts the race as the favourite to win. The office of President of Georgia will be divested from most of its powers after the October elections following constitutional amendments that the previous government of Mikhail Saakashvili’s United National Movement (UNM) pushed through before its election defeat. Executive power will now be vested in the Prime Minister and his Cabinet. The UNM still has to nominate its candidate for the elections, and has announced that it will do primaries to select its candidate. A number of other Georgian personalities are considering contesting as independent candidates. 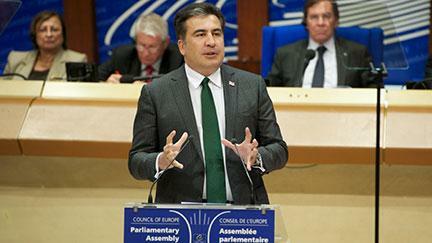 Saakashvili accuses opponents of “winner takes all”mentality. President Saakashvili addressing PACE in Strasbourg on 21 January 2013. (picture courtesy of the Council of Europe). Referring to events that unfolded in Georgia following the Parliamentary elections on 1 October, Saakashvili said that PM Bidzina Ivanishvili and his Georgian Dream coalition was suffering from “winner-takes-it-all mentality” and accused the new government of applying “selective justice” and targeting former government officials, UNM lawmakers, local authorities, judiciary and media. He said that the new authorities were pursuing the “campaign to silence political opposition” and accused the government of attempts to get constitutional majority in the Parliament through “direct blackmails” against UNM lawmakers pressuring them to switch sides. He also accused the government of pressuring Georgian Public Broadcaster (GPB) and claimed that the government “pushed the director of GPB to resign”. No soft touch. Bidhzina Ivanishvili is a shrewd self-made man. Most new governments enjoy a brief honeymoon period at the start of their administration: a time when they can bask in the glory of their victory and a period of grace that the public that elected them allows them before they start demanding that they deliver on their electoral promises. It has now become clear that the government of Bidhzina Ivanishvili in Georgia, which was confirmed by parliament on 25 October, is not going to have such a luxury, as it starts to come to terms with a wide range of problems that they inherited from the previous government. An elegant start to a difficult transition. Georgian Dream and United National Movement delegations meeting on 5 October to map out transition of power. The events in Georgia over the last few days cannot be described as anything but historic. Within minutes of the close of polling in the 1 October Parliamentary elections all exit polls indicated that the elections had been won by the Georgia Dream opposition coalition led by Bidhzina Ivanishvili. For a tense few hours it was not clear how the government of President Saakashvili would react. Early signs were disturbing. There were reports of systematic attempts to alter the vote in favour of the ruling party in a number of marginal constituencies. Then there was statement by Saakashvili himself saying that Georgian Dream had won more seats under the party list vote, but that his United National Movement had won a majority of the single member constituencies vote. If true, this would have opened the way for what many had feared would be a nightmare scenario where two parties claimed victory. In the end however commonsense and statesmanship prevailed. Saakashvili appeared on television and conceded defeat. A normal transition of power through the ballot box has never happened in the South Caucasus before. In Georgia the situation is even more complicated because of the constitutional peculiarities which leave a president in office from a different party, and at least for the next few months with strong power. The preliminary results of the Parliamentary Elections show the winning party to be the Georgian Dream. This means that the parliamentary majority should form the new government.